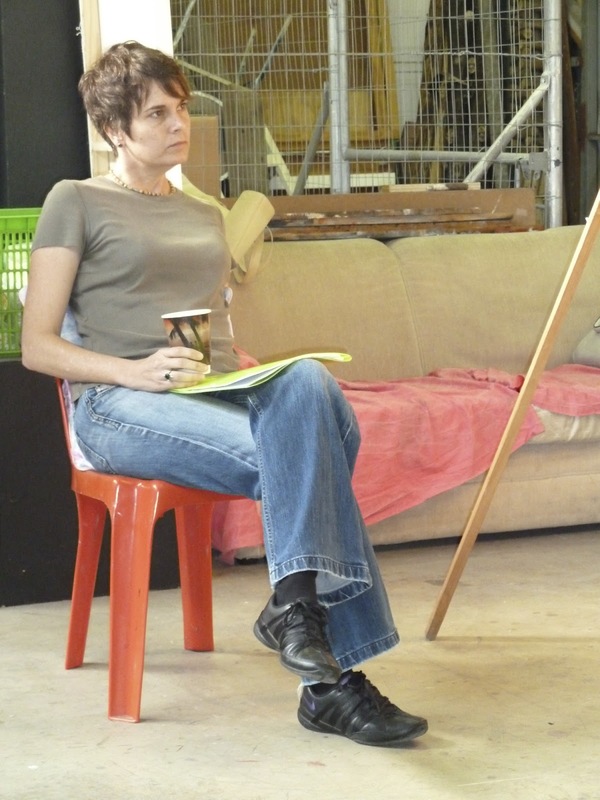 Earlier this year Dee called me up to ask if any of my students would be keen to begin a life drawing course with her. 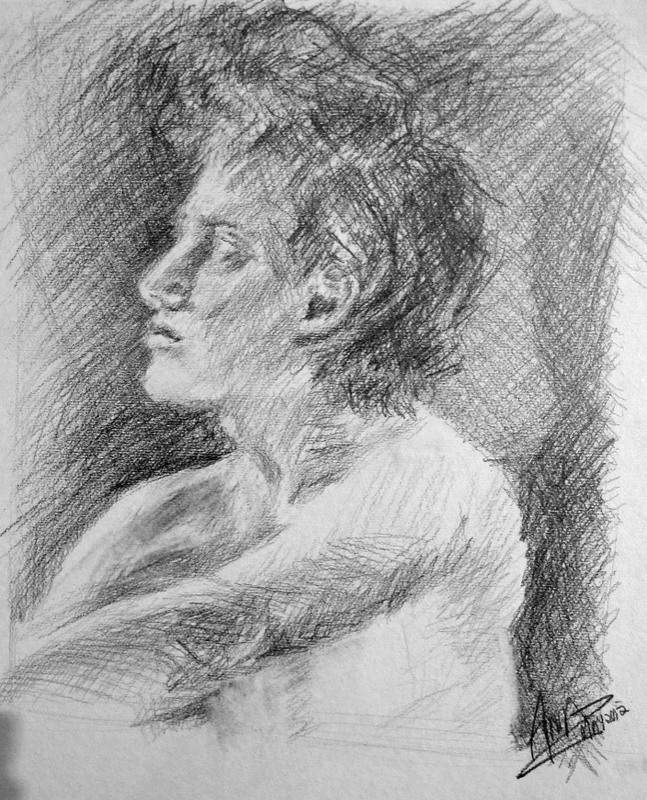 That is to draw the living figure which is posing in front of you versus working from a photograph. My response was to want to dive into that space myself. 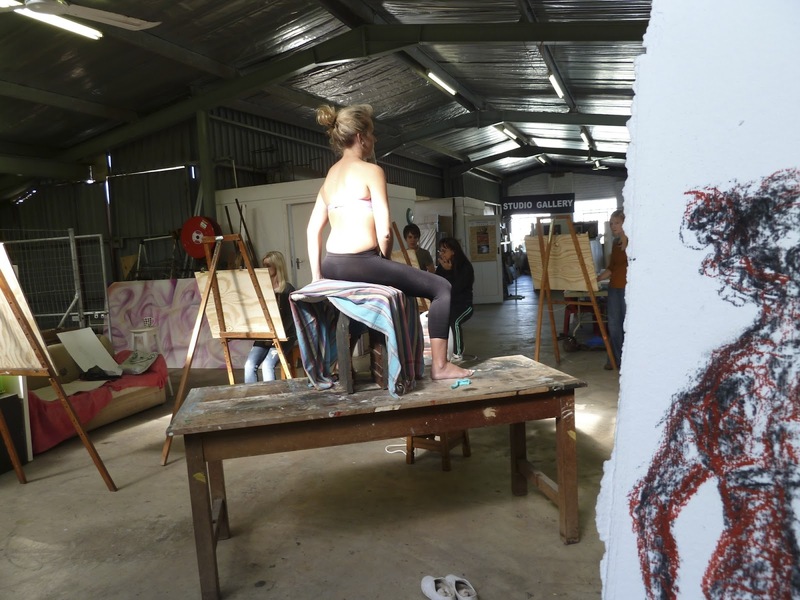 Rather surprised, Dee explained that the teaching would be none other than how we had been taught at Technikon Natal, under skilled artists such as Virginia Mckenny and Fransie Pretorious. My gaze looked over at the colourful swimming gala I was attending and in a second, as the brain calculates the spaces present, past and future, I said yes. All too often , as teachers we pass on the information and watch the growth and satisfaction in our learners and forget to fill our own tanks. Sure I sketch from life whenever I can and the little watercolour and pen sketches are testimont to that BUT, to have someone telling you when one minute is up and to produce 30 gestures in 30 minutes , to remind you of the many facets to be used in drawing is so appreciated. 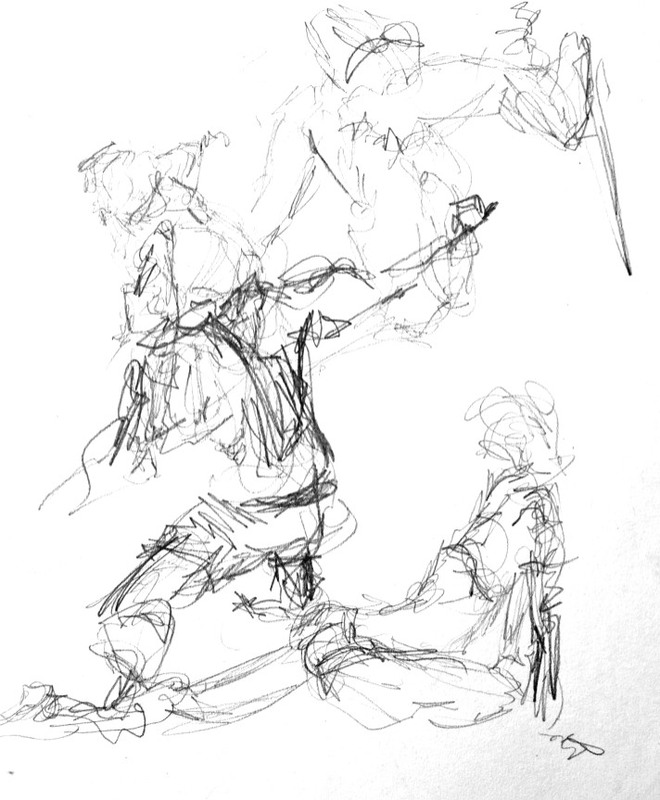 We must have done on average 50 gesture drawings per week, 250 to 300 per 5 weeks which is the time frame per course. 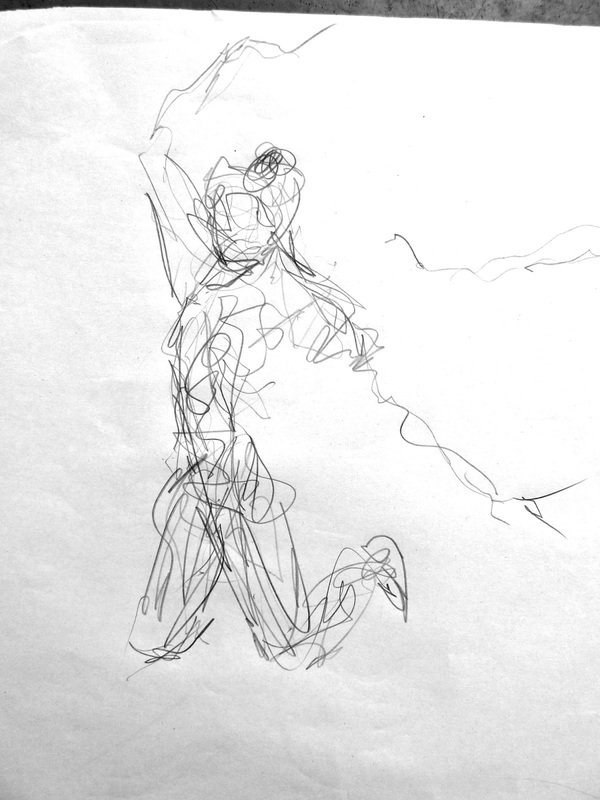 Gesture drawing is the cardiovascular exercises for the brain before the weight and definition part of your routine begins. 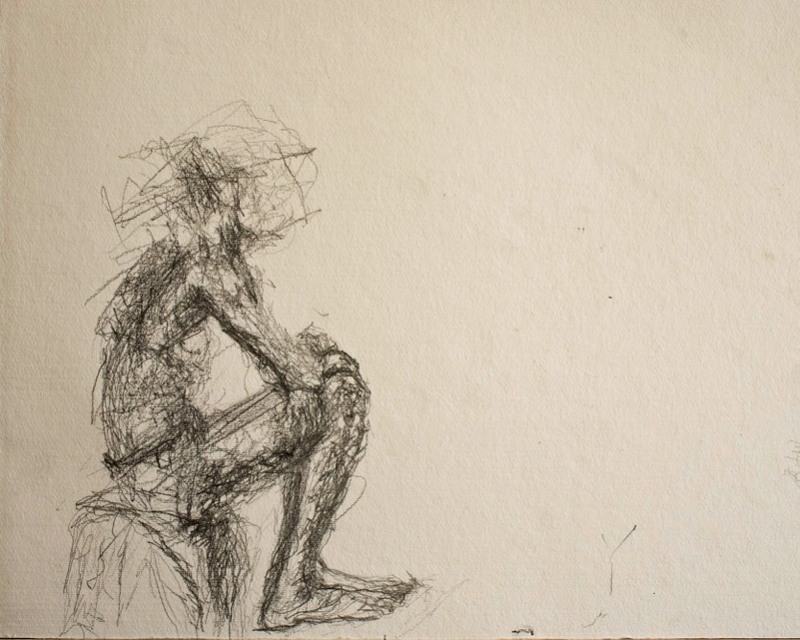 Contour drawing for me is pure meditation. This practice involves careful looking at your model. Like an ant , your eye travels along the contours of the figure as slowly as your brain reads the information and passes this onto your hand. One barely looks at one s paper. Duncan Stewart once said that 90 percent of the time of drawing should be spent with your eyes on the model. Yet so many people use that 90 percent, with their eyes on the paper then wonder why their drawing looks nothing like what they are seeing. The brain almost has to trust that the hand will receive the information from the hand. 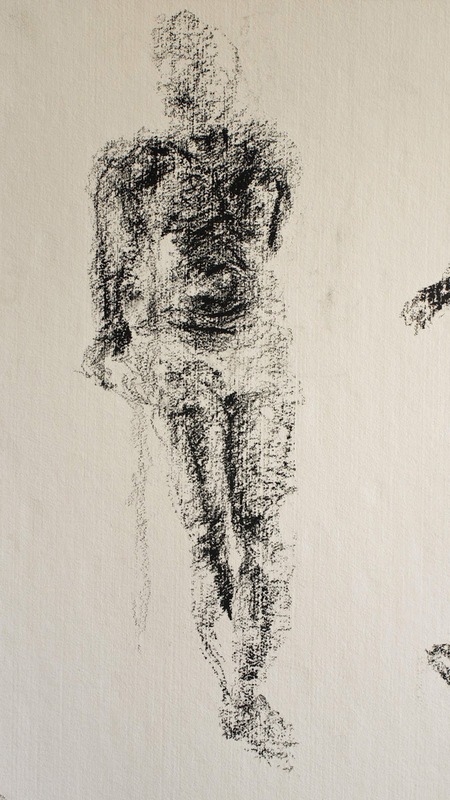 You will see that the lines in my contour drawings at times go astray but this actually adds to the mark making and uniqueness of the exercise. Having completed both courses yesterday I look back in admiration at how Dee has put together a very coherent course. And there is no doubt of the hours of research and practising of the exercise needed on Dee s behalf in order to come up with such great lesson plans. 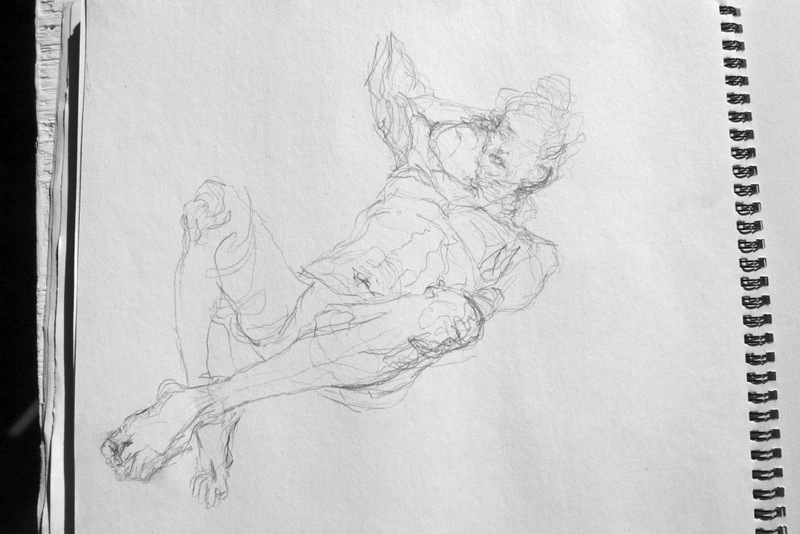 From gesture which looks at essence of movement in space through to eventually capturing the mood of the model specific. We used pencils, on short and long sticks, oil pastels, charcoal, cloths, rubbers (putty and traditional), our elbows and fingers. All the models were well chosen and evoked different characteristics from which we could respond to. We covered all fundamental aspects needed to execute a drawing. Here on the right is a “weight” drawing. My thoughts had to be on modelling the body on a two dimensional surface, starting from the centre and moving towards blurry edges. 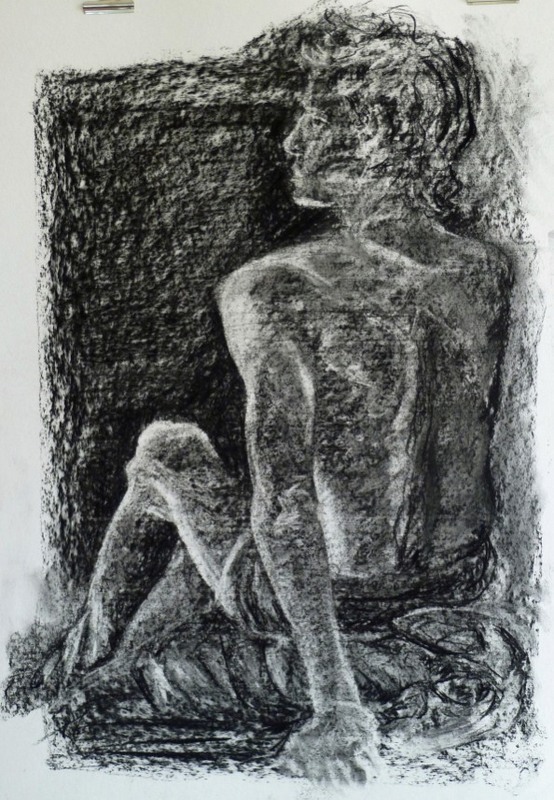 Darkening the areas where I felt the solidity of the figure was. Indeed, one only needs to look at art history to see that from the Renaissance through to Picasso, Matisse and Kandinsky and into modern times, evidence that good draughtsmanship was in place before any attempt was made towards abstraction. -The more one tries to capture the drawing, to own it and to keep it precious…the more it evades you. -The more you let go and have fun, the more it is likely to settle itself. -The more one trusts in one’s inner voice, gut feeling, inner energy and marries this to what it is one sees, the more peace one gets on the inside, the more the viewer responds to your drawing. The result is not to see and recognise a perfect drawing but rather the result is the abstract occurring on the inside.